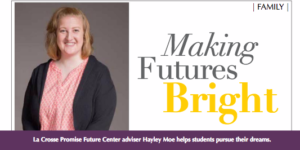 La Crosse Promise Future Center Advisor Hayley Moe has been helping students realize their dreams through education for five years in the School District of La Crosse! She was featured in Coulee Region Women last month. Way to go Ms. Moe!